Paper Monsters currently free on App Store. Grab the colorful platformer while you can. Paper Monsters, Crescent Moon Games' charming hybrid of Mario and LittleBigPlanet, is currently available for free on the App Store. The game picked up critical acclaim when it was released at the beginning of the year with its combination of platforming, crisp artwork, and roster of thoroughly likeable characters. 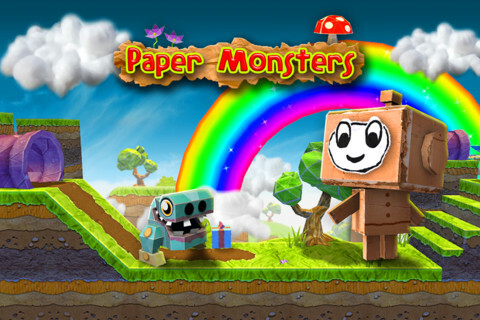 "All told, it's tough to find serious fault with Paper Monsters," wrote Modojo's Chris Buffa when he reviewed the game back in January. "It's a well-crafted and enjoyable platformer that's worth $0.99. If we had to put a finger on one thing that bugs us, it's that Crescent Moon Games didn't go above and beyond what we've seen before, but that's a small issue in comparison to the much bigger picture. Quality title and well worth your time." Paper Monsters is currently available for free on the App Store. With the universal app currently on offer for a wallet-pleasing zero dollars, there's no excuse for not sampling its pleasures for yourself.